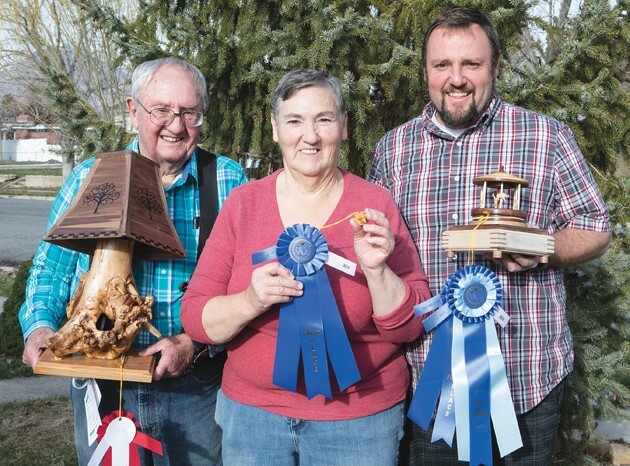 Bonnie Malcolm holds her first place ribbon she earned for her wood work flanked by her husband Jim Malcolm (left) and son Tren Malcolm (right). 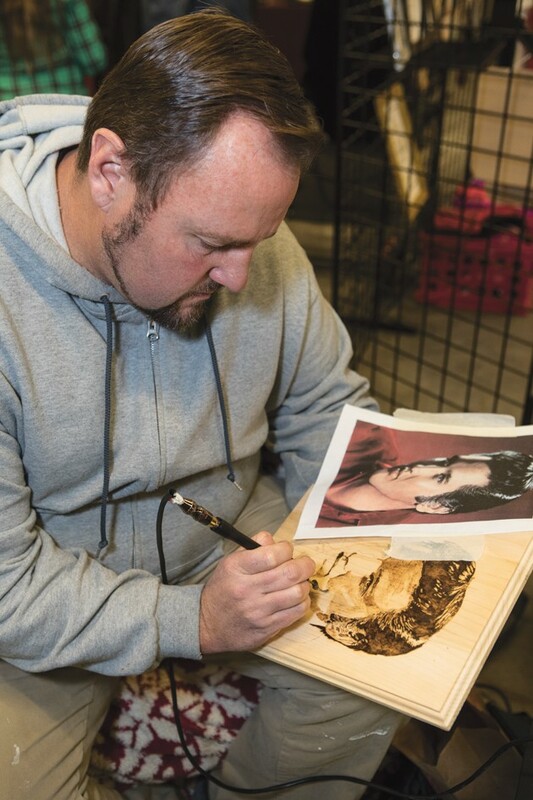 Tren Malcolm works on a Elvis portrait at It’s a Wonderfull Life Festival held at Deseret Peak Complex. 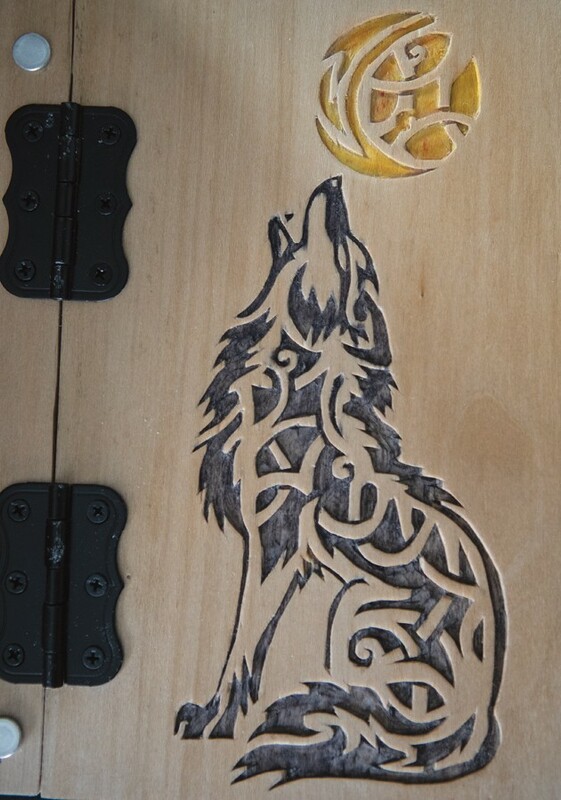 A woodbox with a burned portrait of a howling wolf made by Bonnie Malcolm. 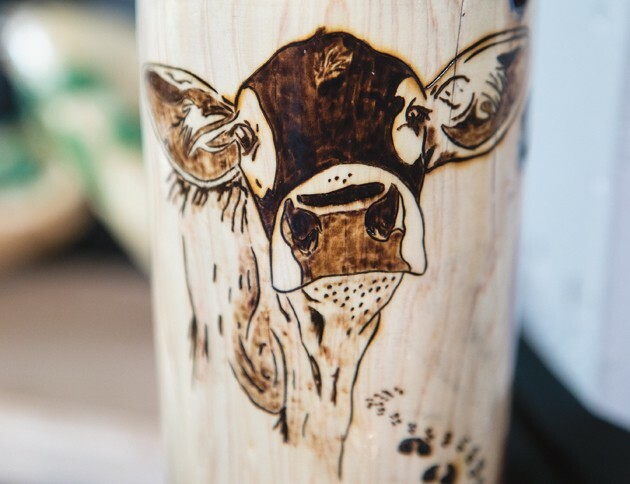 A mug with a burned portrait of a cow made by Bonnie Malcolm. Bonnie Malcolm carves a boot for a project she’s working on. Jim Malcolm holds a piece of wood he found. He creates wood art out of the salvaged trees he finds in the forest. 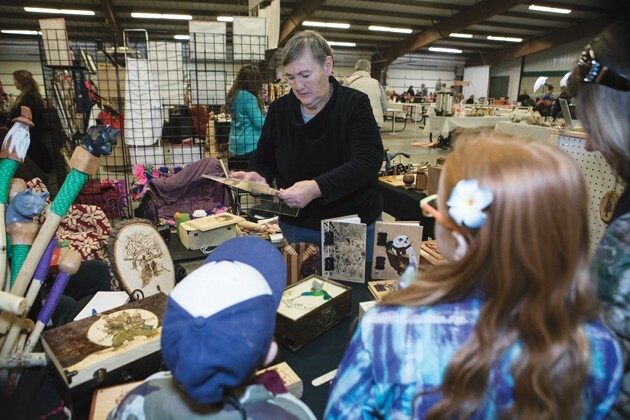 Bonnie runs a sale of one of the handcrafted items in her booth at It’s a Wonderfull Life Festival held at Deseret Peak Complex. 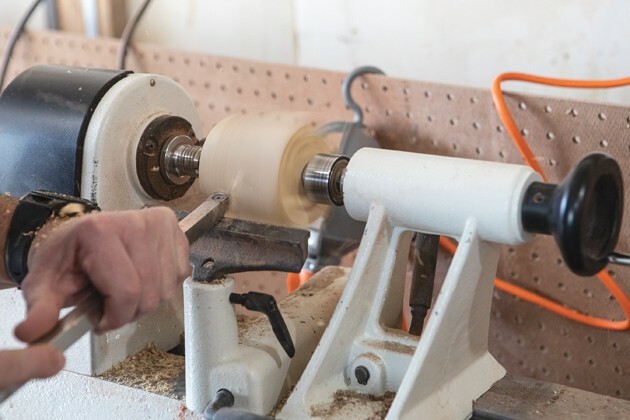 Tren Malcolm works on lathe in his shop. 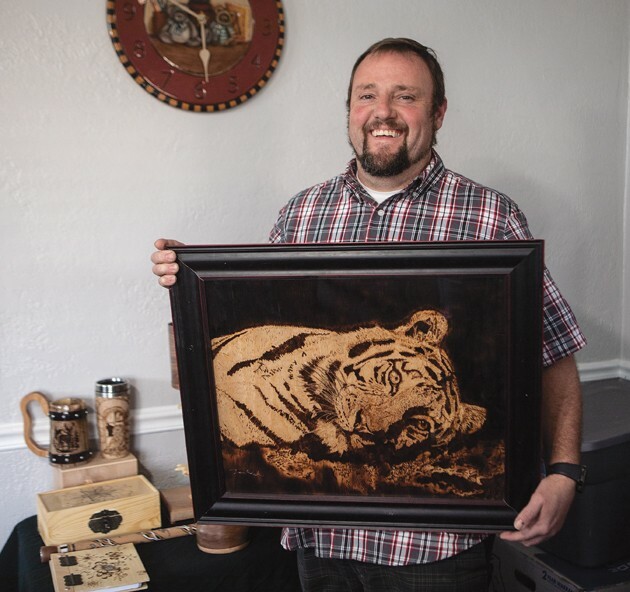 An intricate woodburned tiger took Tren Malcolm about 80 hours to make. 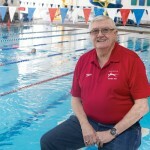 Jim Malcolm whittled away the hours in the guard shack when he worked at Dugway Proving Ground, but that’s not to imply he wasn’t working. Jim literally whittled away the hours. He gathered five or six sticks at a time. He preferred maple. “I’ve carved a bunch and sold a bunch,” Jim said. 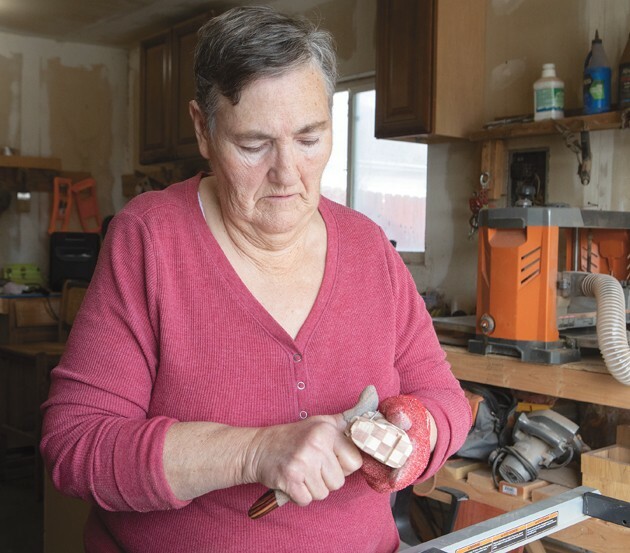 After retiring five years ago, Jim discovered Ron Clements taught woodworking at the Tooele Senior Center, and he asked his wife, Bonnie, to go with him to the class. Soon after, Bonnie started carving birds. This last year their son, Tren, grabbed a knife, too. “I just grabbed a knife and just started carving,” Tren Malcolm said. First, he made a wooden ring for his ex-girlfriend. A friend told him he should sell them. Hence, woodworking became a family affair and a business as well. The Malcolms work out of their home in Tooele. They started selling at venues about three years ago. 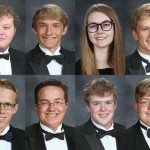 Though Tren only began woodworking a year ago, he was involved in the business from the start. Their business operates mostly at venues, which involves setting up, taking down, and dealing with the weather. The Malcolms tried several names for their business. They always choose to participate in the Tooele Arts Festival. Sometimes the family business includes the next generation. Tren’s daughter, Harley, who uses sign language proficiently, once signed for a deaf customer having a difficult time communicating with Jim and Bonnie. The Malcolms say the funniest thing that happened to them at a venue was when a bicyclist bought a walking stick. “He said, ‘I can’t take it with me because I’m on a bike,’” Jim said. The cyclist took a picture of their sign to contact them later. However, the cyclist’s state of inebriation probably didn’t allow him to remember because the Malcolms never heard from him again. They tried to give him his money back, but he refused to take it. People donate a lot of wood to the Malcolms. Sometimes it happens when people ask them to cut down a tree. As the Malcolms talk, their love for, and familiarity with, wood comes out. 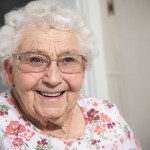 “I made a bird out of apricot wood, and it smelled so good,” Bonnie said. Tren’s favorite wood is walnut. Jim said fellow wood carvers likely think he’s crazy for having a preference for a hardwood like maple. He jokes that he is looking for a knife that will carve petrified wood. “When I’m carving a stick, I like to get the maple and carve it green because it’s softer,” he said. 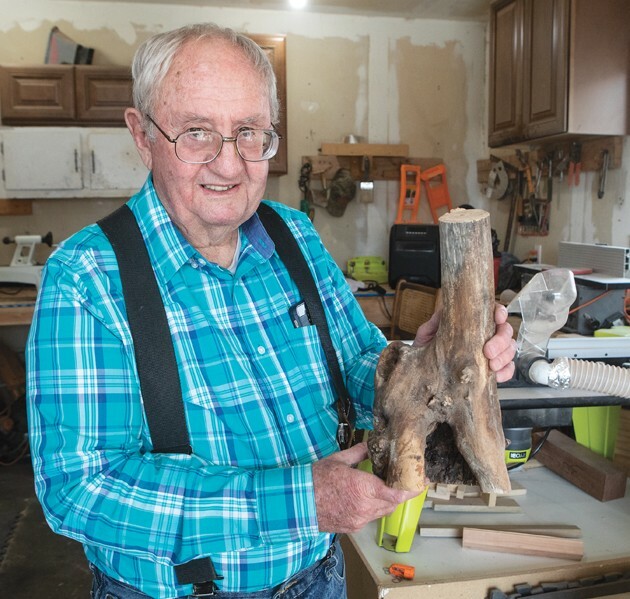 Jim often will incorporate the natural shape of the wood into his pieces, such as a maple lamp he carved from wood recovered after the Middle Canyon fire last year. Bonnie’s favorite wood is butternut. It is a favorite of wood carvers because it’s soft and nice to work with. In addition to the birds, she’s carved eight- and 12-point stars for fingers to explore the angles and points. 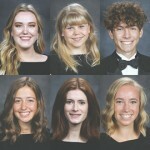 The Burning Tree Productions include figurines, wooden ties, swords, walking sticks, lamps, jars, jewelry, and boxes including phone amplifiers. “You put your speaker down inside the wooden box and the wood amplifies it,” Jim said. The wooden ties include hinges that move with the body. “One time I wore one to church,” Jim said. They recently decided they are not a mass-production company. Sometimes mistakes create the unique. One of Tren’s mistakes turned into a mushroom pot and the creativity kept happening. The Malcolms feel the business is an asset in many ways. 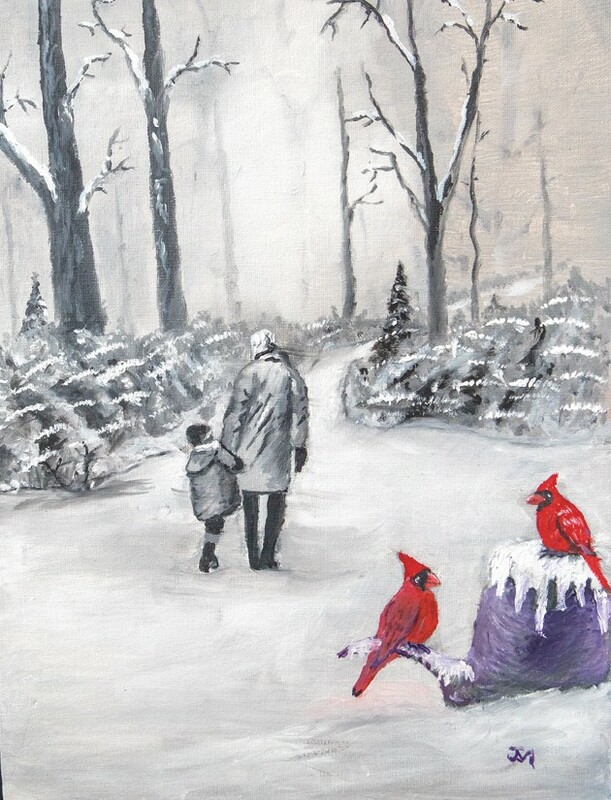 Jim and Bonnie pursued various forms of art throughout their lives, and want people to know they should pursue their passion.